people: Those who get Poison Oak, and those who are going to get it. In other words, though there are those who are immune to Poison Oak, their immunity does wear off with repeated exposure. Contrary to popular belief, the more you are exposed to poison oak, the worse the rash gets. You can't become used to it or immune from repeated exposure, the exact opposite is true. Smoking or chewing will not make you immune! It will make you very sorry! Q:Weren't the American Indians immune to Poison Oak? Did they smoke it to develop an immunity? A:See this page for an updated answer, prompted by an e-mail I received. Original answer below. Western Poison-oak leaves and twigs have a surface oil, urushiol, that is an allergenic irritant. Depending upon individual susceptibility (85% of humans will develop allergic reactions) and exposure, the symptoms can range from trivial to life threatening. The common effect is an irritating, itchy rash, often accompanied with blistering of the skin. The oil can be transferred from one part of the body to another, from one person to another by contact or by transfer through an object (such as an automobile seat belt), from a pet to a person, or from clothing to skin when clothes are prepared for washing. If exposed, the recommended immediate treatment is to wash the exposed area with cold water, using sand or other mineral soil as an abrasive. Warm water will tend to open pores on the skin and will lead to deeper irritation. Waterless soap has odorless mineral spirits as the active ingredient and will cut the oils before they can spread. After the oil is removed, the poison-oak cannot usually be spread by contact with an affected area or by scratching. However, scratching can open the skin especially in cases with significant blistering, making it possible for the skin to become infected by opportunistic bacteria (known as a secondary infection). Demystifying Poison Oak and Ivy. 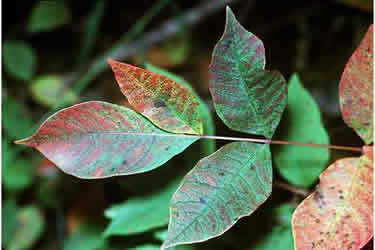 MYTH #1: Only the leaves of poison ivy/oak/sumac can cause the rash. MYTH #2: Wearing long sleeves, gloves, and pants will always prevent a reaction to poison ivy. MYTH #3: Burning is a safe way to dispose of poison ivy vegetation. 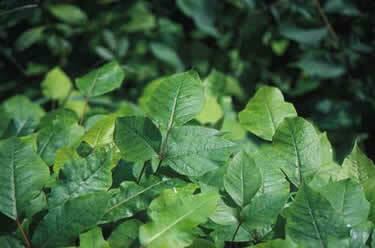 MYTH #4: One can safely handle poison ivy/oak/sumac plants in the winter. MYTH #5: Dead poison ivy/oak/sumac plants are no longer toxic. MYTH #6: Rubbing weeds on the skin can help the rash. MYTH #7: Anti-histamines help the rash and itching of Toxicodendron dermatitis. FACT #7: No study has ever demonstrated that the rash or itching of Toxicodendron dermatitis is affected by anti-histamines. In fact, at least one study has shown that they do not help.1 Histamine has not been demonstrated to be an important mediator of pruritus in any form of dermatitis. Sedating anti-histamines can make patients sleepy and care less about their pruritus. MYTH #8: The blister fluid of poison ivy reactions can spread dermatitis from one part of the body to another and from one person to another. MYTH #9: The rash of poison ivy spreads from one part of the body to another. MYTH #10 Once allergic, always allergic. FACT #10 Allergic responsiveness to poison ivy wanes with age. Many individuals, particularly those with a mild reaction to poison ivy, may lose their responsiveness as they grow older and if they stay away from poison ivy contact for a year. MYTH #11 A physician can diagnose a rash as 'Toxicodendron dermatitis' just by looking at it. FACT #11 While a physician may have a good idea that poison ivy or a relative is the cause of a dermatitis, nothing can tell him or her that a specific rash was due to a specific type of plant - unless there are black spots present. Based on the positive results seen in studies performed by both Kligman and Fisher, immediately after suspecting contact with a Toxicodendron, individuals should wash with water (and soap, if available).1, 13, 26 Studies show that the sooner the exposed areas are washed, the lesser the reactions. The potentially contaminated hand that can spread antigen must be washed first.34 While urushiol is not water soluble, it probably physically forces the urushiol off the skin. Additionally, high concentrations of water seem to inactivate urushiol.1 Strong soap and scrubbing merely irritate the skin and are not more effective than mild soap and gentle washing.13 While various authors have warned against using soap with water,3, 8 the concern of spreading urushiol over greater surface areas seems to be theoretical only. The fingernails need to be thoroughly washed, also, as urushiol can remain under them for long periods and remain allergenic. 80% of the population will develop a skin rash when contacting the leaves of the poison ivy plant. The severity of the rash varies from person to person. People between 5 and 20 are the most vulnerable to severe forms of skin reaction. Older persons generally have less severe disease. 10% of people develop very severe skin reactions with major swelling and itching. How can poisoning from these plants be prevented? The only true way to prevent this miserable problem is to avoid contact with the toxic oil of the plants. Long pants and sleeves are very important if you are venturing into an unknown wilderness area. If possible, wear gloves, boots and a hat. Learn to recognize these plants and avoid them. A new barrier cream called Ivy Block or bentoquantam 5% can be applied to the skin prior to exposure and will form a protective layer on top of the skin. The drug Trental may decrease the rash slightly, but needs to be taken before exposure to the plants. Immunization for poison ivy, oak or sumac is not available at this time. What can be done if exposed? Wash all exposed areas of the skin with cool water. Flowing water is better to irrigate and remove the urushiol oil. Use a nearby stream, river or garden hose if available. If soap is used, wash it off the body and do not spread to other areas. Wash all clothing as this may have been contaminated by urushiol oil. Wash all possible contaminated gear as well as animals.